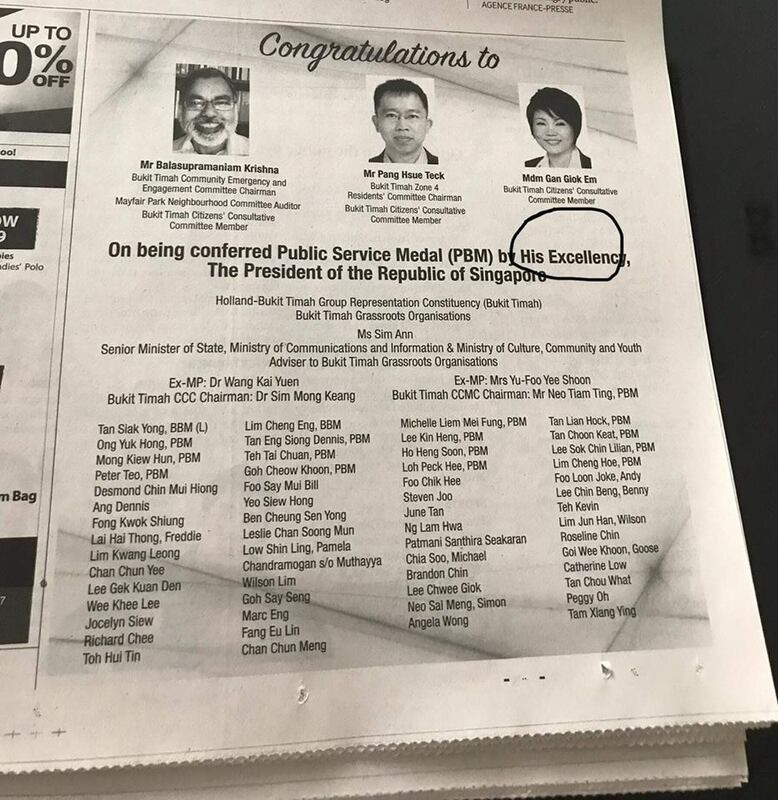 A newspaper advertisement taken out by the Bukit Timah Grassroots Organisations (GROs) to congratulate its National Day Awards 2018 recipients has drawn the ridicule of some netizens. The advertisement said the Awards were conferred to the recipients by ‘His Excellency, The President of the Republic of Singapore’. The President of Singapore is a woman and the advertisement should have referred to her as ‘Her Excellency, The President of the Republic of Singapore’. Netizens who criticized the newspaper advertisement faulted the advertisers as being ‘stupid’ and for not proof-reading the advertisement before it went to print. Some others questioned how much it cost to print the quarter page newspaper advertisement. A cursory check suggests that such an advertisement with the Straits Times may cost anywhere between $15,000 – $25,000. There are about 15 different kinds of GROs in Singapore, with a total of 37,000 grassroots leaders and volunteers in the 1,800 GROs under the PA umbrella. These GROs include the Citizens’ Consultative Committees (CCCs) which are at the very apex of the GRO pyramid, Residents’ Committees (RCs), Neighbourhood Committees, Community Club Management Committees (CCMCs), Youth Executive Committees, among others. (See here.) The government has just announced a new Residents Network (RN) organisation which will reach out to residents of both private and public housing. The Auditor-General’s Office faulted the People’s Association (of which the GROs are a part of) for lapses in welfare assistance schemes management and for lapses in procurement and contract management for major events. 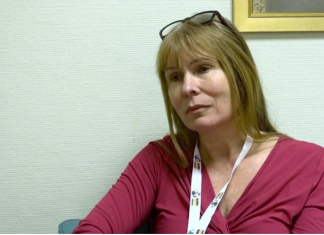 People’s Association (PA) replied to the Auditor-General that it has taken steps to address the financial controls lapses highlighted by AGO, and that it will ensure that their officers comply with the rules. In 2015, the Auditor General’s Office (AGO) conducted a test audit of the PA and found numerous financial discrepancies among the GROs it spot-checked. The AGO found 35 CCMCs had failed to get the appropriate approvals in awarding contracts, and nine GROs did not comply with PA’s financial rules. There were also “numerous errors and omissions” in the updating of disbursements from the CCC ComCare Fund (CCF) by seven of eight CCCs checked. One of the irregularities involved 13 tenancy contracts, amounting to $3.67 million, which the management committees of community centres or clubs awarded without competition. The chairman had also approved two other contracts, worth $32,000, to a company where he held a senior management position. Additionally, he approved payment of $1,500 to another company where he held a directorship and was a shareholder. Subsequently, the panel found no wrongdoing on the part of the accused CCC chairman. In September 2015, just before the last General Election, the Workers’ Party (WP) charged that the GROs have been politicised by the PAP. In responding to the WP’s charge, the People’s Action Party (PAP) denied the charges and asserted that GROs are not partisan and are meant to serve the Government of the day. The advertisement by Bukit Timah GROs showed that one of the recipients of the National Day Award is Pang Hsue Teck. Mr Pang was the proposer of the PAP team which contested in Holland-Bukit Timah GRC. The team comprised of candidates Dr Vivian Balakrishnan, Christopher De Souza, Liang Eng Hwa and Sim Ann. The PAP team was the winning contestants at that election. Mr Pang was awarded the Public Service Medal in 2018 by the Prime Minister.